A big congratulations to Mandy at Caratunk Girl and Jon at SwimCycloRun for amazing finishes yesterday at Ironman Lake Placid! I stalked tracked them pretty much all day! Thanks to Jason at CookTrainEatRace for inducting me into the B-Hall of Fame. I am very honored and humbled to be part of your inaugural class! I was the recipient of my own online medallion - that is actually pretty cool, despite the fact that my teeth look freakishly weird. Humor me.. what are the funny search words used to find your blog?? 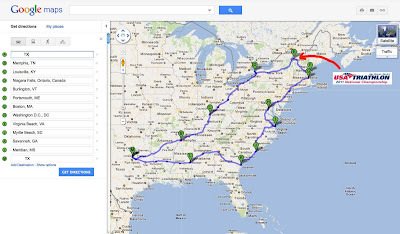 Tentative Road Trip - Need your East Coast Ideas!! Woo hoo! 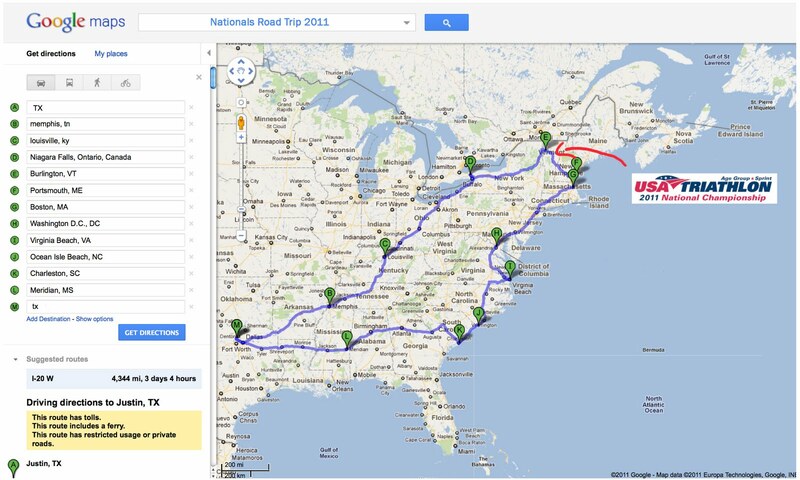 Here's the tentative road map for our USA Triathlon Nationals trip. But, what else? We'll be driving through a lot of states and would like to add some destinations to see. Lighthouses? Plantations? I don't know. I'm a CA girl and definitely not East Coast savvy. Definitely concerned about visiting bigger cities and dealing with traffic/ parking, etc. It will be my mom, daughter (3 years old) and me. So, activities have to be active-toddler friendly. Casino's, museums, any place you have to be quiet or requires a lot of walking... are pretty much out. I'll be shipping my bike back to TX from VT, so we won't have it on the back of the car at that point, thank goodness. Our entire trip will take about 2 weeks. We won't always have full days to sightsee, but if there's places we shouldn't miss, please let me know!! That's the way... uh uh.. I like it! Pull on your polyester and gold chains, because IronTexasMommy raced the Disco Triathlon this weekend. They spoiled us with schwag for this race! A tech tee, running socks, a running hat, logo'd swim cap & a backpack! All with the very fun Disco logo. The alarm went off at 4:30am and I'll have to admit, I just wanted to stay in bed. I did a quick check of the weather.... Awesome! 88 degrees. No amount of rain dancing was going to change our 20- day 100+ degree weather streak. We were in for a very hot, very humid race. Welcome to racing in Texas! I've been looking forward to this race for awhile, because a) the atmosphere is fun and b) several of my friends were racing, which makes any event that I do. I picked up my mom and we made it to the Lake Ray Roberts up in Denton by about 5:45am. putting my arm around him"
I got bodymarked and racked my bike-- open racking! Yay! I found my friend Marcy and she moved her bike next to mine. Some of the volunteers were dressed in 70's garb... from big afro's to disco ball earrings. Always a fun atmosphere. While the X-50 race is more my preferred distance of racing, I knew that the heat was going to be a big factor, so I chose to race the Olympic. Probably the best idea, since I've done a minimal amount of training since IMTX. I knew that this race would be a good indicator of what I needed to focus on for Nationals. Ok, who am I kidding... I need to work on everything! Ha! The start of the race was pretty much a cluster. First, we can't see the three distance buoys. Apparently, the race directors decided to just have the X-50 & Olympic distance racers swim the same distance- so, ours ended up a couple hundred meters long. And, the water was at least 87/88 degrees. It felt like bath water. Second, we're swimming directly into the sun. We watched the X-50 wave leave, and after a couple hundred meters, they had to get up and walk across a sand bar and then once they got back in the water, the majority of the pack started swimming off course. They scrambled with a motored boat to direct them back towards the buoy. Awesome. I'll be spotting every stroke, it seems. They started all the male and females under 40 in the same wave. So, Jason and I started together. We hit the sandbar at the same time and then I lost sight of him. I did however, have a jackwagon "trying to draft" off me. I say trying to, because the dude kept hitting my feet. When he grabbed onto my timing chip. I hit the brakes, turned around and popped my head up. He stopped and looked at me. I stared him down through my goggles and then went on my way. There were words I wanted to say, but I didn't. I found Jason a little later, when he stopped to fix his timing chip, and then he finished about a minute out of the water ahead of me. T1 was a long haul. Once I got out of transition and down the road a little bit, my friend, Paul who was doing the sprint-distance flew by me on the bike. I saw Jason at one of the turnarounds and also had the opportunity to see my friends Marcy and Michelle at different parts. There were a lot of the sprinters riding on mountain bikes and there were a lot of hills out there, so I made sure that I encouraged all of them and let them know that they were working harder than all of us! The Brian Loncar Team posing with Aquaphor samples! Apparently I stopped for a massage or something in T2, because I was in there for over a minute and a half! Really? It was really, really hot at this point. I just kept telling myself to hold it together. Unfortunately, my calf started to cramp and I had to stop to stretch it out some. Best decision I could have made. I didn't want to risk another leg injury. Looking at the runners, they were either doing really well or really bad. There was no in between. You could see it on their faces. I dumped as much water on me as I could and kept re-filling my running water bottle with ice at the aid stations. After about mile 2, I started to feel much better and was able to get into a rhythm. It was a two-loop run and thankfully much of it was shaded. I finished :09 seconds short of my goal time. It was a PR by 9 minutes, so I should be pretty happy with that, especially with the minimal training, but still being so close to my goal, killed the joy of the PR. I placed 2nd in my age group and was 13th female overall out of 47. - Tinted goggles made a huge difference for me, because we were swimming into the sun. I raced with clear ones last year at this same race and had a hard time spotting. Know your swim course! - Carry more water on the bike than you think you'll need. I went through one water bottle before I was even 5 miles in. - Eat more pre-race, because I do not tolerate racing/ eating in the heat. I just can't stomach eating anything. This happened at IMTX and this race. Lesson learned. workout, "Fight Club" on the bike trainer. The Fight Club workout was designed to build power over longer durations, while increasing leg-speed through 23 (!) 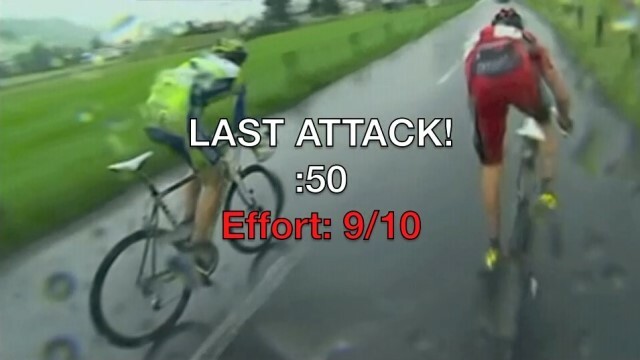 unannounced ‘attacks’ that will challenge you to accelerate and then recover while still making a massive effort. 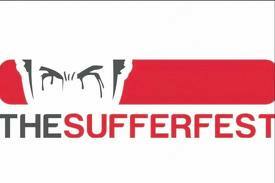 And to make you wish you never heard of The Sufferfest. But we won’t take that personally. The definition of insanity is doing the same thing over and over and expecting different results, right? So, instead of just wishing to be faster and stronger, I pushed myself, changed out my sweat-drenched towel and went at it some more. I attacked when directed almost to the point where I thought the bike was going to launch off the trainer. I stood up, pushed the big gears and gave it the 10/10 effort that it wanted. I finished exhausted, but with a big grin. Heck yeah. Absolutely! IronTexasMommy will be back for a lot more! Met my "mentor" for an early morning track workout focused on drills and speed drills. 400m sprint / 200m recover. 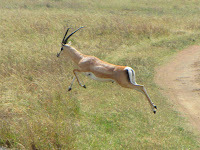 My idea of a sprint is about 100m.. tops. Once. 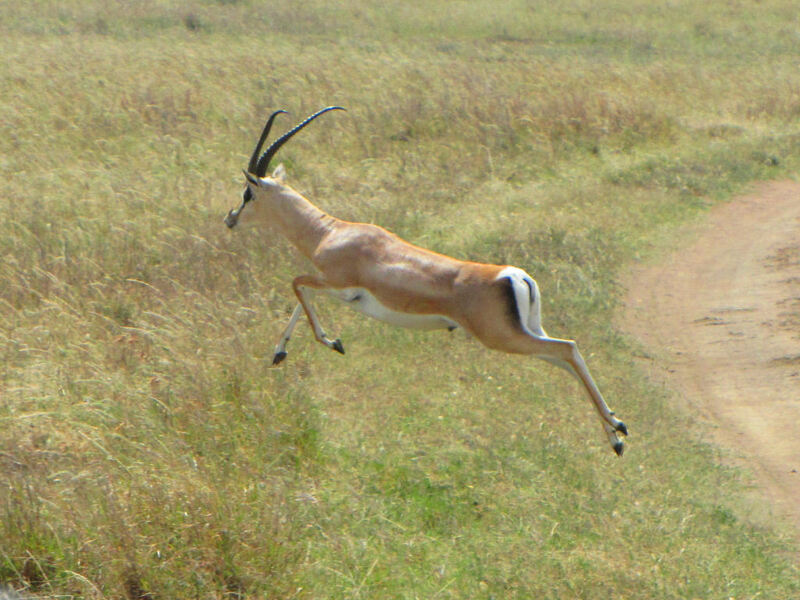 It didn't help that part of the group running with us was a couple of high school kids that were tall and lanky and ran like gazelle's. All-State track champions.... or something like that. Oh well, I know I have work to do. Transitioning from long and steady to fast and controlled is going to take a lot of work. Stride, high knees, quick arms... I've got quite a bit of fixin' to do (as they say in Texas). Hope you're all having a great training week! I've made a slower-than-anticipated recovery back from Ironman Texas. The hyperextension/ hamstring issue put a big damper on my biking and running, so I did the right thing for once.. and actually rested it. 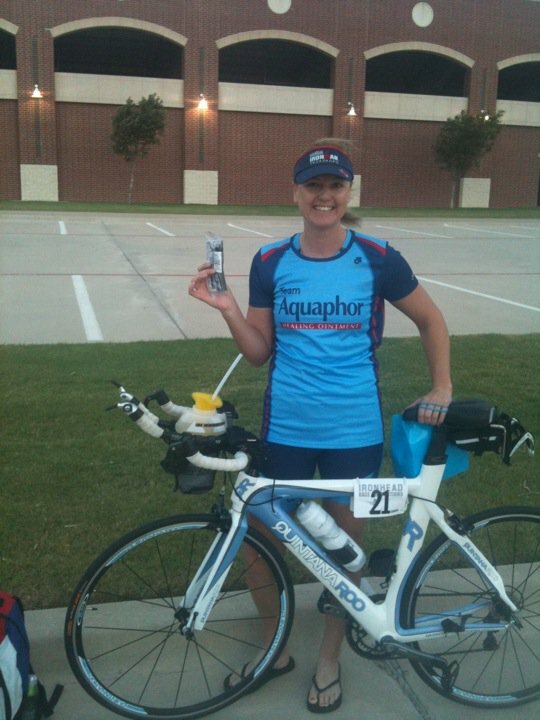 My first venture back into racing was the Mansfield Sprint Tri on June 19. I signed up on a whim because I was kind of hoping it would just kick my tail into gear to get back to consistent training. It wasn't my best race, but I took 1st in my Age Group and was the 4th Female Overall. I'll take it. Unfortunately, I over-compensated for my injured leg and ended up straining a muscle in my calf in the other leg. Uggh! More rest. 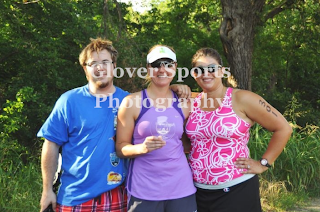 Blake did the swim, Michelle did the bike and I did the run. Talk about pressure. The run was only 2 miles, but it was painful 2 miles! You're full out sprinting the entire way. I started out in 3rd position, got passed by a guy like I was standing still (where the heck did he come from? I am NOT going down in 4th position) and then was able to overtake the girl that originally started the run in the 1st place position. I left my lungs somewhere on the course after the first mile, but kept going. Overall, it was a fun tri. It was my first relay attempt and would definitely do it again. 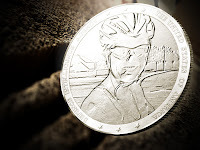 My next race is this weekend at the Disco Triathlon in Denton. This race is just about as fun as the name sounds. Disco music, people wearing gold chains and afros, and a 70's band rocking out at the finish. I have several friends doing this one, including Michelle, Marcy, Jason & Allison. Plus, I'm looking forward to being able to represent Team Aquaphor! Next up after Disco is the USAT Age Group National Championships. Can't wait to post about this trip soon! It is going to be an amazing road trip! In future racing news.... I've officially been challenged by BigDaddyDiesel to compete against his blog team "Team USA" as part of the awesome bloggers "Country of Texas" team (including Jason, Allison & Jeff) at the American Triple T in Ohio in 2013. I had never heard of this race, but the minute I read about it, I was ready to sign up. Three days of tri events! That just has AWESOME written all over it! 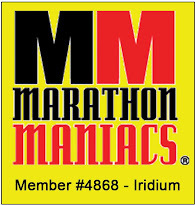 Add that to getting to race with my blog friends would make it a weekend to remember!